Posted on January 14, 2012 by Greg C.
Posted on December 13, 2011 by Greg C.
2011 was an incredible year for social sharing. Â I spent the free time over the past 2 weeks processing incredible amounts of data (we process 70+ terabytes per week! ), and Jeff did an awesome job turning my spreadsheets into a great infographic. Â I am really excited to share with you the great nuggets we were able to find amongst the 11MM+ publishers and 1.2B+ users who share through AddThis. Posted on October 11, 2011 by Greg C.
We celebrated a birthday this month, as AddThis turned 5 years old. Â In 5 years we have seen over 1.7 trillion views of our tools, the fall of MySpace, and the rise of Facebook and Twitter. Â AddThis goes way beyond simple sharing tools. Â We process over 70 TBs of data a week so that our publishers can learn what impact their content is having on the social web. As the director of product for AddThis for the last 10 months, it is amazing to see the evolution of such a simple set of tools become something so essential that over 10 million publishers worldwide use our product. Â Every day is a fun challenge of building a product for over 1.2 billion users. Five years in Internet time feels like an eternity, and the data we have can clearly show and predict trends happening across the web. Â The infographic we released today shows some of those trends. Â It will be fun to see what trends emerge over the next 5 years. Last night we hosted the first DC Big Data meetup. Â At Clearspring, when it comes to Big Data we process it. Â 9M domains, over 1B Unique Users per month and over 1 Petabyte of data per year. Â You can check out the entire presentation Matt gave last night. Â A lot of companies talk about Big Data, but in the end its all about how you use the data that matters. Â Check out the presentation below. Posted on March 1, 2011 by Greg C.
AddThis Blog Â» Blog Archive Â» Data from Last Nightâ€™s Oscars. So the Oscars are over, and looking back the data was able to predict that Natalie Portman would win Best Actress, but the data was misleading on Best Movie and Best Actor. Last night we also pulled data as the Oscars were happening. Â It was great to see in real time how our data changed based on what was taking place on the TV. 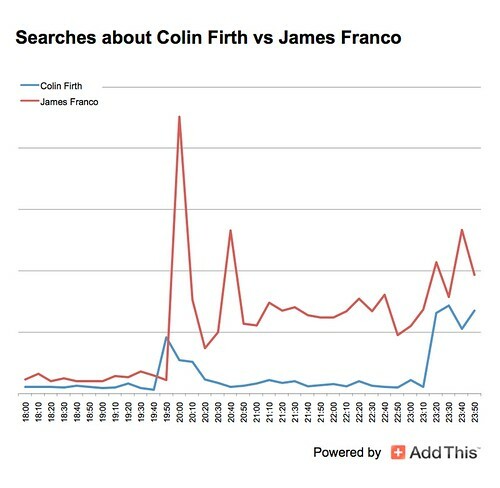 Â Check out the chart below, you can see how searches for James Franco spiked during the opening monologue, and Colin Firth got a huge jump after winning Best Actor. While Inception did not win for Best Picture (sorry, Jordan), the King’s Speech was a terrific movie, even if it did not capture the internet’s attention as much as the other movie’s out there. 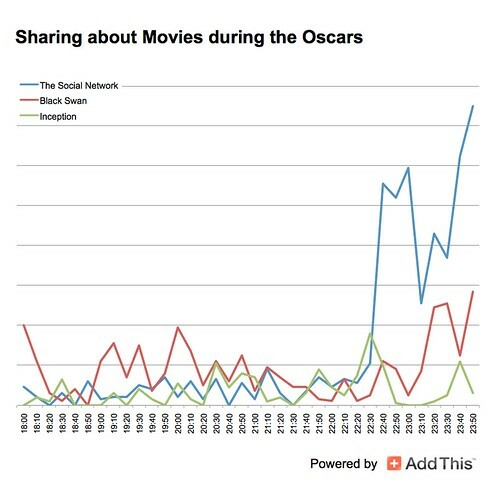 Can Online Sharing Stats Predict the Oscars? Posted on February 27, 2011 by Greg C.
Over at AddThis, we analyzed some statistics trying to predict who was going to win the Best Actor and Actress as well as Best Movie based on how much sharing activity we have seen. Â Predictions are just that, guesses based on what we see is happening on the internet and our network. While I would love to see Jesse Eisenberg and Natalie Portman win, will it happen? Â It is too hard to say. Â The internet can be a funny place, Jesse Eisenberg may have been mentioned a lot because The Social Network is about Facebook, or maybe he is just that good of an actor in his role. Â Natalie Portman has always been an internet favorite, but her role in Black Swan may have caused an over-index in sharing. As for best movie, I am rooting for Inception. Â My childhood friend was the co-producer and the film was really great. Â Go Jordan, I am rooting for you. I can’t wait to see if the analytics are correct in predicting who will win. Â Great job team for pulling this together. Yesterday we had a great release for publishers looking to have more control over access to their analytics, and even easier registration for new publishers and users. Â For new users, we now support creating an account with Facebook, Google and OpenID making it very easy to get started integrating sharing into your site. There are a lot of other goodies in this release that we will cover over the next week, but the new account and registration changes are going to make life a lot better for our publishers. Posted on February 7, 2011 by Greg C.
How the Social Media World Reacted to Super Bowl Ads [STATS]. We provided some insights into the aftermath of the Super Bowl ads. Â We saw huge increase (3000%) in shares in posts mentioning Pepsi Max, but Groupon was much smaller. Â While search may have indicated who the winner was going to be, clearly social can indicated who the advertising winners were. Posted on January 18, 2011 by Greg C.
Clearspring got some great coverage today from SiliconAngle. Â I definitely love the coverage they gave us on the new analytics release the team did at the end of the year. Â By empowering both publishers and services to see how their audiences are interacting with their content the web can become a smarter place.